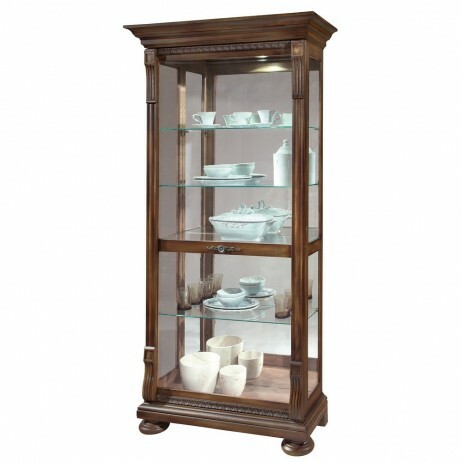 Simple yet elegant, this curio cabinet is sure to add sophisticated touch to your decor. The Howard Miller Curtis Curio Cabinet is finished in Acadia cherry on select hardwoods and veneers. The finish is inspired by the natural yet rustic look of reclaimed wood with attractive patinas and burnishings. 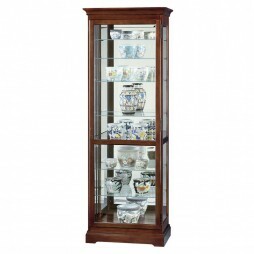 The beautiful case features a multi-tiered flat top and base with unique columns, carved Acanthus moldings, large bun feet, and beveled upper and lower glass on the door. The LED lighting offers you a whiter, brighter, longer lasting light to illuminate your collectibles. A glass mirrored back improves the view. 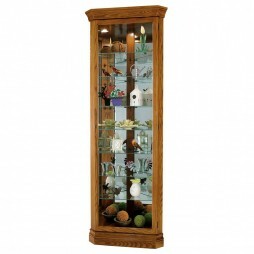 The Curtis Curio Cabinet is the perfect display cabinet for all your collectibles. The beautiful case features a multi-tiered flat top and base with distinctive columns, carved Acanthus moldings, large bun feet, and beveled upper and lower glass on the door. Locking door slides in both directions and features a decorative knob and back plate. 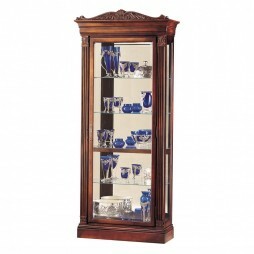 The Embassy Curio Display Cabinet has a sophisticated, detailed design. It features an intricate pediment topped with a beautiful shell and ornate leaves. The corners feature fluted columns with beautiful column caps detailed to match the pediment. Constructed in select hardwoods and veneers and finished in an Embassy Cherry stain, this locking cabinet features a beveled glass front to showcase your collection. The halogen lighting further enhances it with the brighter, whiter and longer lasting illumination. The No-Reach light switch is located on the back of the cabinet. Pad-Lock cushioned metal shelf clips increase safety and stability on the glass shelves that can be adjusted to any level within the cabinet. Adjustable levelers under each corner provide stability on carpeted or uneven floors. 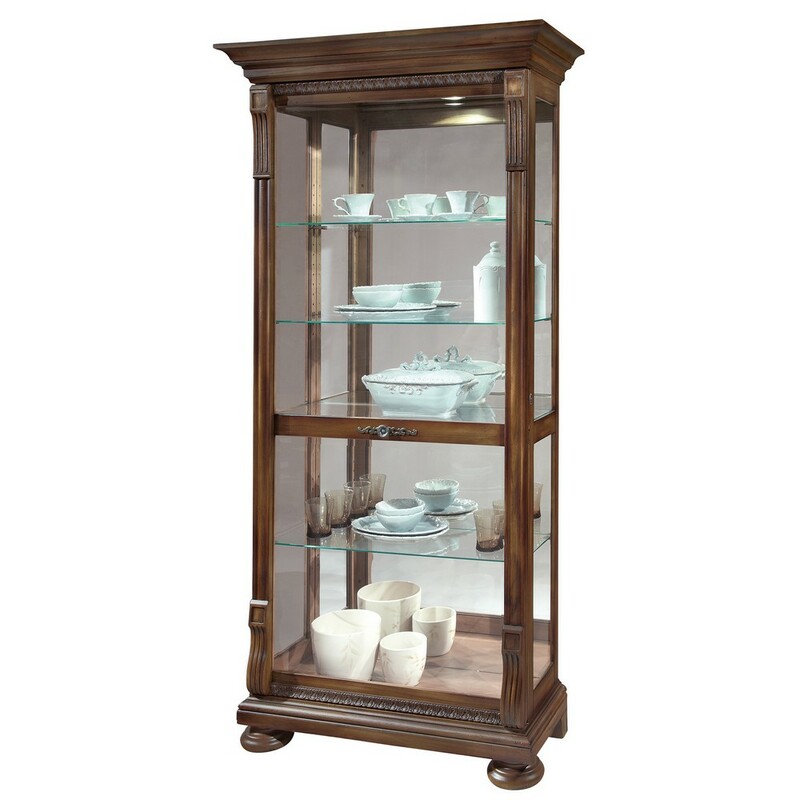 If you are looking for a larger cabinet for your collection, the Chesterfield Display Cabinet was designed for you! 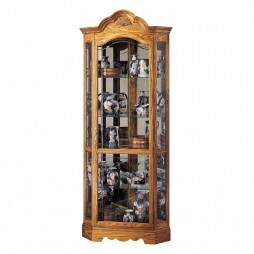 It features extra deep shelves and extra height in a beautiful Windsor Cherry cabinet constructed from select hardwoods and veneers. This piece features halogen lighting for brighter, whiter and longer-lasting illumination. The Touch-Lite adjustable light switch offers lighting choices of low, medium, high and off. The No-Reach light switch is conveniently located on the back of the cabinet. The glass shelves can be adjusted to any level within the cabinet and offer eight levels of display. Pad-Lock cushioned metal shelf clips increase interior stability and safety while corner adjustable levelers stabilize the cabinet on uneven and carpeted floors. This cabinet features and locking door for added security.